Families at Elsa England, please check out this great event coming up in a few short weeks! Parents, please note the IMPORTANT RSVP DETAILS at the bottom of the flyer. 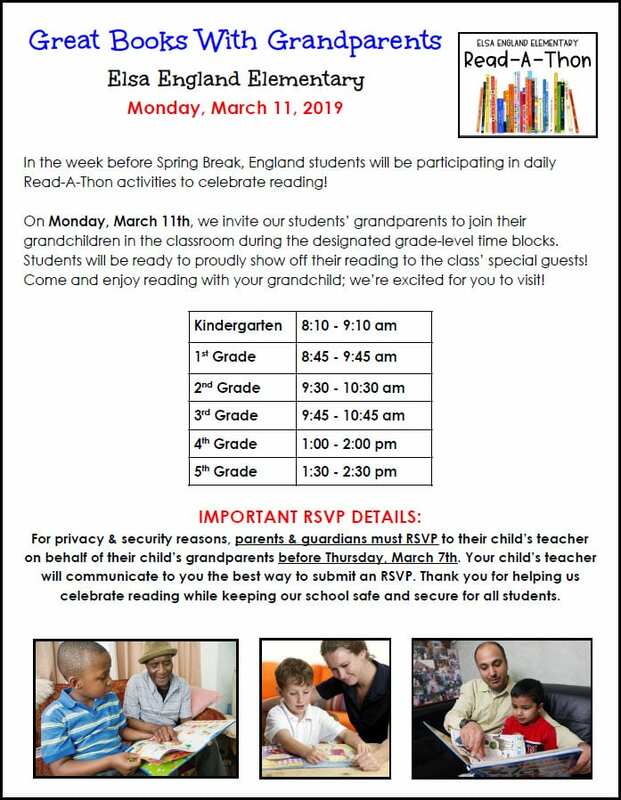 RSVPs need to be made by parents to the teacher, on behalf of the student’s grandparents — by Thursday, March 7th! Author/Illustrator Christian Robinson to visit K-2 on March 4th! Kindergarteners, 1st and 2nd graders are very excited to have the opportunity to hear from New York Times Bestselling, Award-Winning Author-Illustrator, Christian Robinson, as he speaks about his debut picture book, Another, at England Elementary on Monday, March 4th! Another will be released on March 5th, but our students can purchase it through BookPeople and our school library and it will arrive in time for Mr. Robinson to sign and personalize it to your student on the day of his visit! Preorders need to be turned in to our library by Friday, March 1st with this order form. Orders can be paid by check (made out to BookPeople), cash (exact change please), OR orders can be placed online through the BookPeople website!!! All ordering information is on this order form. If you’d like to hear more about Mr. Robinson and his work, please check out this presentation I created and shared with students a few weeks ago! At the end of January, we held our sixth annual Bluebonnet Voting Parties!! This year, so many students were eligible to vote that we had seven HUGE voting parties in the library! A record-breaking 516 students cast their vote digitally, hung out with their friends, ate freshly popped popcorn (with/without m&m’s), enjoyed Bluebonnet-related games, and proudly wore their “I Voted” sticker the rest of the day. It was a BUSY day, and SO MUCH FUN!!!! Hello Hello, Emily Arrow, Hello! PreK students, Kindergarteners, and 1st graders are very excited to meet Emily Arrow on WEDNESDAY, FEBRUARY 27th! 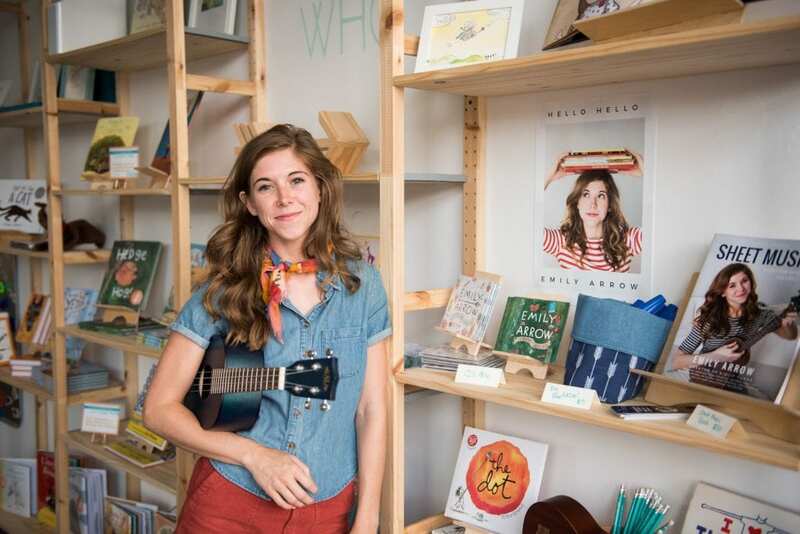 Emily is a former elementary-school-music-teacher-turned-kidlit-singer/songwriter; writing and performing fabulous songs based on picture books! 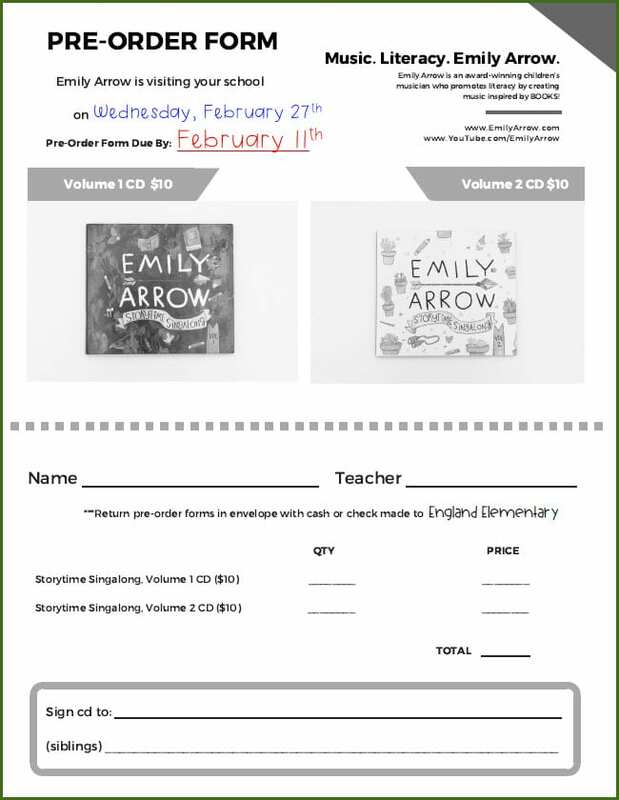 You can watch many videos of her original songs on her Emily Arrow YouTube channel, and we are excited to offer the pre-sale opportunity to purchase a signed CD before her visit! Order forms will be sent home in the next few days, and please return them by Monday, February 11th! You can also click the image below to download a new pre-order form. Thank you to our AWESOME PTA for funding and supporting this very special literacy-music visit from Emily Arrow! The Six Flags Six Hour Reading Program has begun! 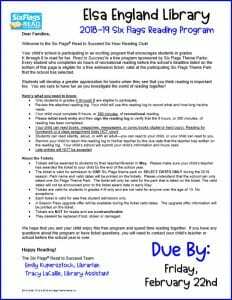 Students in grades K-5 are encouraged to participate in the Six Flags Six-Hour Read to Succeed Program running from NOW through FRIDAY, February 22nd. Six Flags Fiesta Texas encourages students to read for six hours outside of their regularly assigned reading — to READ FOR FUN – and is happy to reward those students with a free ticket to Six Flags Fiesta Texas! Forms will be distributed this week in Thursday Folders to all K-5 students. 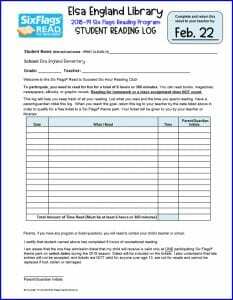 Please read the front and back of the form, fill out as directed (including parents’ initials and signature) and return NO LATER THAN FRIDAY, February 22nd to your child’s teacher. The theme park tickets will arrive mid-May for those who participate. Get ready to READ, READ, READ! If you need an additional copy, click on the form below to print out a PDF! To hear more about the program, watch the short video below!